Being a huge fan of different historical periods and vintage clothes I had to schedule in some thrift store shopping in California. I figured that San Francisco being such a cultured and artistic city I would find some novel and unique pieces there. The first thrift store we went to was Eco Thrift about forty-five minutes south of Oakland in the Bay Area. I was very excited for Eco Thrift as it’s a bit outside of the city and a huge warehouse I figured there would be tons of treasures inside. It takes a good while to go through everything and I actually only came out with two pieces. I tried a lot of clothes on, but was only sold on my Baja purse (seen in my Season of the Witch blog post) and this lavender sweater. I love the colour and the way it drapes due to its natural composition of modal, silk and cashmere. We then made our way into San Francisco’s Mission District, which boasts the city’s best selection of thrift stores. We found a great parking spot on parkingpanda.com. I highly recommend the website; I used it several times for the trip and never had any trouble. The website allows you to prepay your parking, so you can find the cheapest nearby parking and needn’t waste time driving around looking for a spot. We went to El Faralito in The Mission for lunch, one of the city’s best kept secrets. From the outside (and inside) it looks like a complete dive, but the food speaks for itself. Here you can get what the San Franciscans refer to as a “Mission Burrito”. Oversized, delicious burritos. I made two meals out of my burrito which I added guacamole and sour cream to. This was probably my favourite meal of the trip. After lunch we walked down Mission hitting up all the thrift stores. I purchased this California hoodie for $5 from Goodwill. It’s almost brand new and kind of looks like a Cal sweatshirt. My favourite thrift store by a mile was Thrift Town. They have a great selection. I was so excited to find this seventies style poncho, it has all my favourite colours and pretty little rosebuds. I could definitely see this making its way around The Haight back in the day. I also picked up a Baja sweater and this cardigan from American Vintage. I’ve never seen any American Vintage in Canada, but I’ve found it in several thrift stores in America. It reminds me of Free People, one of my favourite brands. In the mission I also found these awesome Flower Power patches in a nice fabric store. I still haven’t taken them out of my wallet. They will probably end up on a pair of cutoffs. The last thrift store we stopped at was the Goodwill at 11th Street. I found this beautiful peasant blouse. I love the unique cut of it. We then took the bus up to Lombard Street. I got a Peace Tea while waiting for the bus. I love the packaging, but I was really disappointed that it tastes like artificial sweetener. Lombard Street is a classic depiction of San Francisco’s impractical streets. Getting there from where the bus dropped us off was some feat, with the steep angle. This area of the city has an incredible view of Alcatraz. Lombard is not the most crooked street, though with the quaint little houses and brightly coloured flowers spilling out, it is the prettiest and thus the most popular. When I originally planned the trip I wanted to experience driving down the hairpin turn street. In retrospect, I’m so glad we didn’t. I can’t imagine there is much to see from driving down and there’s no way you could find a parking spot afterwards to enjoy the beauty of the street. At the bottom there was a thick line of tourists completely blocking the path for cars. There are also several traffic police moderating the traffic. Following Lombard it’s a quick walk down the Fisherman’s Wharf. 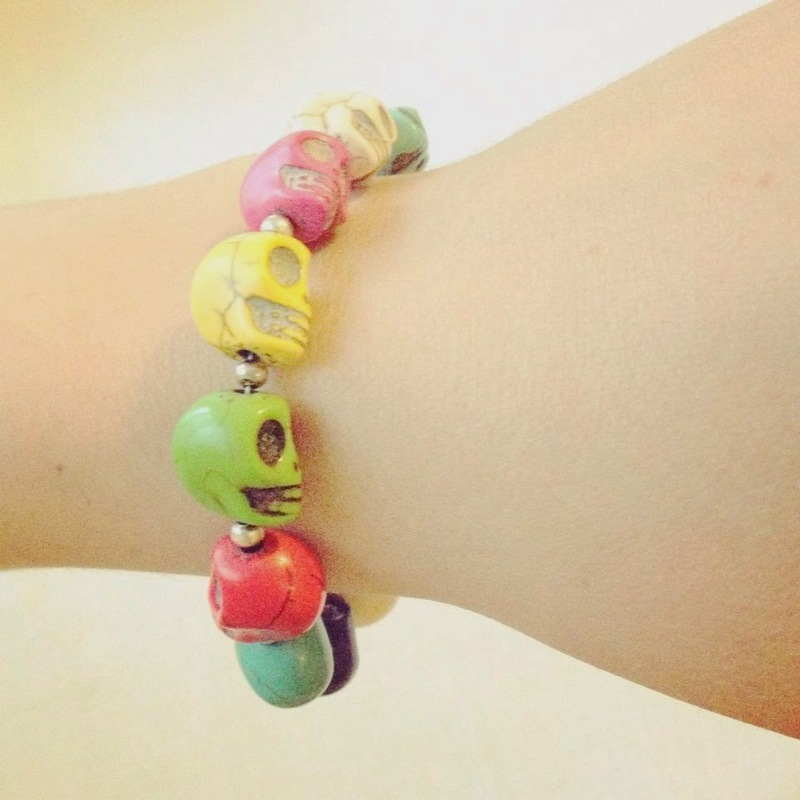 I bought this multicoloured skull bracelet from a vendor. I actually looked for, but couldn’t find one of these while I was in Mexico last year as they remind me of the Día de Los Muertos sugar skulls. I also got a shot of the iconic cable cars, which have two lines in the city. By the time we made it back to The Mission (we got off at the wrong bus stop) we were too exhausted to walk down Valencia street which is said to have comparable thrifting as Mission Street. So went back to our accommodations in Oakland, which I booked through AirBnb.